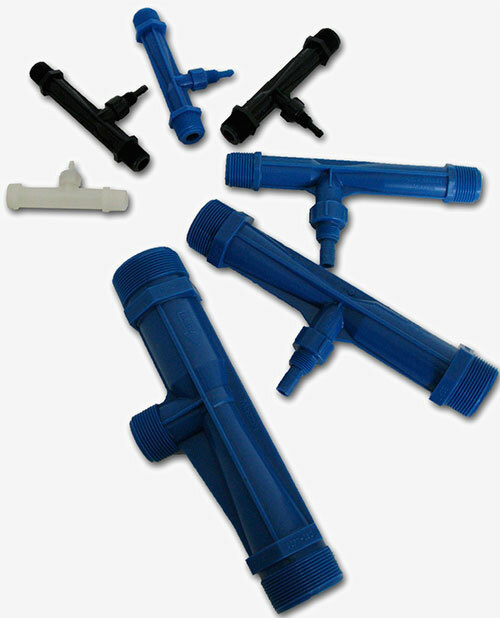 Venturi injectors are a highly efficient way to introduce liquid or gas into water. They are ideal for dosing chemicals, aerating water, dosing ozone and fertigation. “Fertigation is the injection of fertilizers, soil amendments, and other water-soluble products into an irrigation system. Fertigation is related to chemigation, the injection of chemicals into an irrigation system. The two terms are sometimes used interchangeably however chemigation is generally a more controlled and regulated process due to the nature of the chemicals used. Chemigation often involves pesticides, herbicides, and fungicides, some of which pose health threat to humans, animals, and the environment. Increased nutrient absorption by plants. Reduction of fertilizer, chemicals, and water needed. Reduced leaching of chemicals into the water supply. Reduced water consumption due to the plant’s increased root mass’s ability to trap and hold water. Application of nutrients can be controlled at the precise time and rate necessary. Minimized risk of the roots contracting soil borne diseases through the contaminated soil.